Circumstances of time have shattered and deconstructed ancient representations of the human body, leaving only fragments. Because Egyptian artists paid careful attention to the depiction of each part of the body, even a small fragment of an Egyptian sculpture or relief can reveal significant insights. Although exhibitions of Egyptian art have traditionally attempted to reconstruct such works in pursuit of a complete image, contemplating the bigger picture can distract us from important details. While artistic conventions required representing the human body in its most complete form, the Egyptians respected the divinity of each individual part of the body. Egyptian mortuary texts associated each part with a particular deity, and certain amulets or votive offerings to the gods were created in the shape of distinct body parts. Important organs were embalmed separately to ensure their function in the afterlife, and replicas of certain body parts occasionally provided an alternative abode for the spirit. Examining the images of body parts displayed here, whether fragments of objects or amulets that were meant to stand alone, exposes nuances of the technique, symbolism, and diversity of ancient Egyptian art. The jagged edges on some pieces, for instance, offer a better understanding of the materials and methods used by Egyptian artists. The detailed workmanship of many of the objects draws attention to the significance of every element. The variety of styles and body types demonstrates that Egyptian art constantly evolved, despite the common assumption that Egyptian artists followed a strict canon, or unchanging set of rules. Egyptian scribes used hieroglyphs as a writing system for about three thousand years. The Egyptians believed their hieroglyphs to be magical and divine, and referred to them as medu-netjer, “words of a god.” Accordingly, the hieroglyph for each body part represented its “ideal” form in the best possible view. The artistic depiction of each part of the human body was in turn based on a hieroglyph. The arrangement of these hieroglyphic forms to construct one body made the complete figure appear somewhat awkward, yet recognizable. For instance, paintings and reliefs generally depict the head and mouth of a figure in profile, while the eye and eyebrow are shown as if in full frontal view. For this reason, fragments representing individual body parts often appear more realistic than complete sculptures. The various Egyptian terms for amulets derive from verbs meaning “to protect.” Worn as jewelry or placed inside mummy wrappings, amulets protected the living and the dead from any possible impairment or harm. Some amulets in the shape of a body part guarded the part they represented or its efficacy. Others provided magical security by alluding to specific myths about body parts of a god and perhaps functioned to replace certain damaged organs so that the body would be fit for the afterlife. Funerary texts prescribed specific materials and colors believed to have magical properties for many amulets. For instance, green and blue, the colors of cyclically renewed vegetation, water, and sky, symbolized resurrection and rebirth. Red signified the power and energy of the solar force as well as the danger and chaos of the desert. Although semiprecious stones often bolstered a particular aspect of each amulet’s magical power, the color itself was deemed extremely important. Thus, colored glass and various hues and glazes of faience were frequently used as more affordable substitutes for the costly stone. 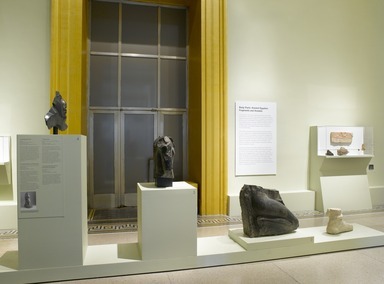 August 31, 2009 Body Parts: Ancient Egyptian Fragments and Amulets features thirty-five representations of individual body parts from the Brooklyn Museum’s ancient Egyptian collection, many of which will be displayed for the first time. This special exhibition will be on view at the Brooklyn Museum from November 19, 2009, through October 2, 2011. 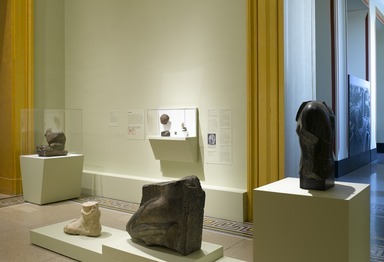 This exhibition uses objects created as distinct body parts, as well as fragments of sculpture, to highlight the realistic portrayal of individual body parts in canonical Egyptian sculpture. The ancient Egyptians carefully depicted each part of the human body, respecting the significance of every element. 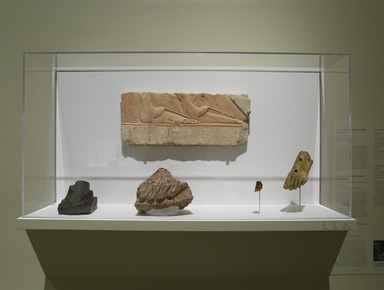 When viewed individually these sculptures and fragments reveal the ancient notions of body and pose, as well as details of workmanship frequently unnoticed in more complete sculptures. To better explain each of these elements, the exhibition will make connections to specific objects in the Museum’s Egyptian collection and to Egyptian hieroglyphs. A major highlight of the exhibition is an eye cut from crystalline limestone, obsidian, and blue glass that was once part of an anthropoid (human-shaped) coffin similar to the Museum’s famous Cartonnage of Nespanetjerenpere, currently on view in the permanent installation. 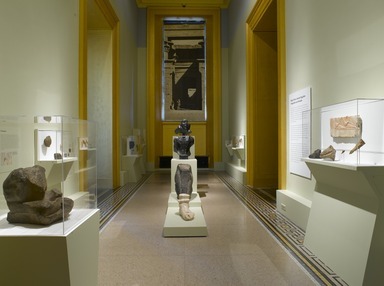 Body Parts also features a headless kneeling statue of Khaemwaset, a son of Ramses II, whose pose reflects a new development in religious sculpture, and a colossal left foot that was created as a votive offering for the god Serapis. This exhibition is organized by Yekaterina Barbash, Assistant Curator of Egyptian Art, Brooklyn Museum.